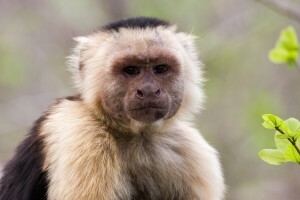 Making an alpha male: the behavior, endocrinology, and genetics of dominance in male white-faced capuchin monkeys (Cebus capucinus). One of my current research projects in Santa Rosa examines behavioral, endocrinological, and genetic correlates (including kinship, reproductive success, and the major histocompatibility complex [MHC]) of male life history and reproductive strategies. The main goal of this longitudinal project is to understand how hormonal and social factors influence the emergence, from puberty into adulthood, of dominance status in male white-faced capuchins (e.g. Jack et al., 2014). My collaborators (Stacey Tecot, and Eva Wikberg) and I have several current grants (Leakey Foundation, Nacey Maggioncalda Foundation, National Geographic Society) that enabled us to continue data collection for this project through 2017, thereby providing a decade of behavioral data and hormone samples from male capuchins residing in five study groups (2007-2017). Identifying traits and processes influencing individual variability in reproductive success is fundamental to understanding evolutionary processes. In our capuchins, like many other socially living mammals including humans, there is a strong association between dominance status and reproductive success, however we still know very little about how and why some males attain alpha status while others do not. These data, along with our ongoing studies of the role of the major histocompatibility in male dispersal and mate choice decisions (funded by the LA Board of Regents, with Jessica Lynch Alfaro), will provide us with a holistic picture for examining male dominance and reproductive biology. Legolas has been the alpha male in our CP study group since 2007 (an impressive 10 years during which time he sired >20 offspring). This male has been studied since his birth in our LV study group in 1994. Update: Legolas is no longer alpha male as of Nov. 2018, though he remains on in the group as a subordinate male. The effects of forest protection, forest regeneration, and climate change on primate populations. Santa Rosa National Park at the end of the dry season. Photo taken by K. Jack in April 2015.